Susan Ferreira is a proud member of the Bars of the State of New Jersey and the Commonwealth of Pennsylvania. She is also admitted to the United States District Court of the State of New Jersey. Ms. Ferreira is married and has two wonderful sons. She is an Associate Attorney at Rothenberg, Rubenstein, Berliner & Shinrod, LLC and practices primarily in the areas of complex personal injury and medical malpractice. 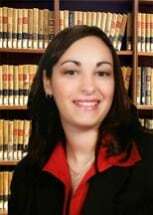 Ms. Ferreira earned her undergraduate degree from Rutgers University in Newark, New Jersey and her Juris Doctorate degree from Widener University School of Law in Wilmington, Delaware. After graduating from Widener Law, Ms. Ferreira served as a judicial law clerk for the Honorable Ned M. Rosenberg, J.S.C. in the Essex County Superior Court Civil Division in Newark, New Jersey. As a law clerk, she was responsible for researching, analyzing and preparing bench memoranda in the areas of employment law, motor vehicle accidents, worksite accidents, medical malpractice, contract law, personal injury, and insurance liability cases which are submitted to or argued before the Superior Court. Upon completing her clerkship, she began working as an Associate Attorney for the Law Offices of Craig M. Rothenberg where she was responsible for handling all aspects of plaintiff's personal injury matters including medical malpractice, slip and fall accidents, motor vehicle accidents, and worksite accidents. In addition to her professional experience, Ms. Ferreira dedicates her time assisting families with special needs children navigate through the New Jersey Early Intervention System (NJEIS) and education system, and resolving denials of insurance coverage and unnecessary delays of treatment for therapies and other medical services.